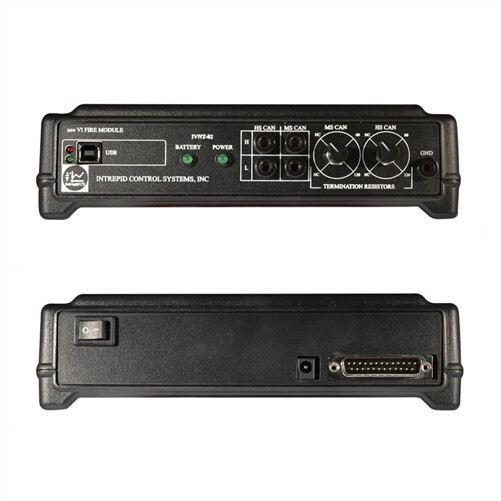 Produktinformationen "Vehicle Network Tester (IVNT-02)"
Intrepid Control Systems' Vehicle Network Tester (IVNT-02) allows users to connect test low-level physical layer capabilities of on-board controllers connecting to Controller Area Network (CAN). The IVNT supports low-level, physical layer validation on up to two dual wire CAN networks as well as supporting connection for data monitoring/transmitting on two additional dual wire CAN busses, one single wire CAN bus, one LSFT CAN bus, and up to four local interconnect networks (LIN). In conjunction with the included Vehicle Spy 3 software, the IVNT will test high-level application/diagnostic layer services and functions. The IVNT will run each test and give a Pass/Fail status. The IVNT setup has been designed for ease and simplicity. Connect the controller to CAN High and CAN Low, power the unit, and start the test in the PC application software. After taking these few steps, you will receive a report on the entire system test. Individual tests can be selected and run as well. Weiterführende Links zu "Vehicle Network Tester (IVNT-02)"
Kundenbewertungen für "Vehicle Network Tester (IVNT-02)"